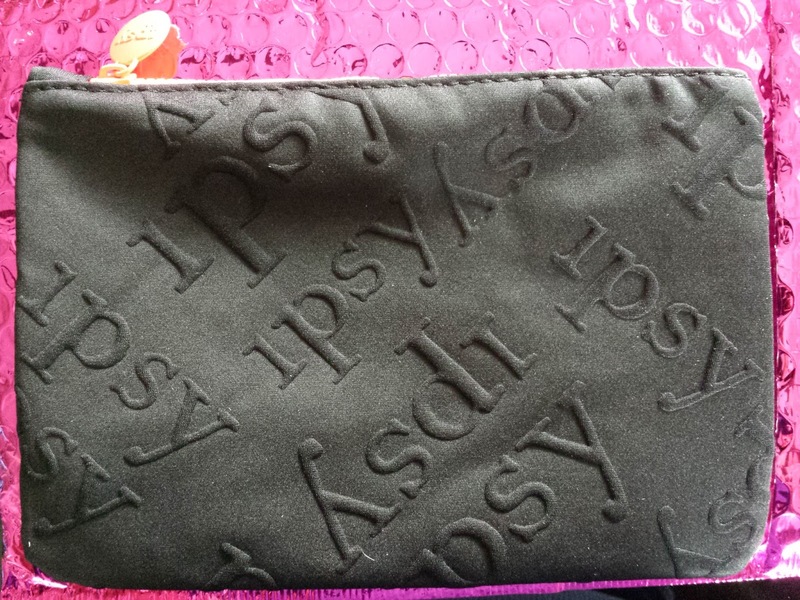 Ipsy got here early this month. I'm talking two days after it shipped which is pretty darn quick for first class. The theme was "Swim into Beauty" so I'm guessing we'll see stuff for having some fun in the sun. Perhaps some waterproof makeup? Well there's definitely a lot of blue in here. I guess that goes along with the water theme. Time to take a closer look, shall we? Pure Brazilian Miracle Leave-In Conditioner (1oz travel size value: $6) - I don't use leave-in conditioners very often but I will occasionally bring it out when I have a case of the frizzies. I've fallen in love with the scent of Beauty Protector's leave-in conditioner/detangler but I think this one smells almost as good. It's kind of coconutty. This is infused with keratin so it's great for dry brittle hair. I would keep this but I just swapped for another Beauty Protector one and I don't go through these fast enough to keep an extra on hand. Or maybe now that it's summer and I should be doing the beach thing like everyone else, I'll be getting lots of sun damaged hair and will be needing lots of leave-in conditioner. Hmm. We'll see. Absolute New York Nail Lacquer - Turquoise (0.57oz full size value: $5) - I'm always happy to receive nail polish because I have a weird nail polish addiction and will collect them all even if I already have a similar color. Bonus: these polishes are 5-free so they don't have all that bad stuff (dibutyl pthalate, toluene, formaldehyde, formaldehyde resin, or camphor). Of course, the trade-off is that these polishes usually don't last as long but I don't mind because I change it up pretty often anyway. I'm 98% certain I already have a turquoise-y color but this is pretty and even though I know I'll probably never even finish my first bottle, I feel compelled to keep this one as well. C is finally getting annoyed that I'm always doing my nails lately and not hitting the gym or going for runs like I used to. He's bummed that I'm becoming girly. Say whaa--- ?? Dr. Brandt Pores No More Vacuum Cleaner (0.25oz sample value: $11.25) - Ever since I first heard of this I've been curious to try it. With a name like "vacuum cleaner" who wouldn't be? I have two tubes of the Pores No More Pore Refiner and found out that my pores are too huge to see a difference. And my big ol' pores are great at collecting dirt so I always have blackheads. Every single blackhead remover mask/scrub/cream I've tried so far has been unsuccessful. The best method I've come across are pore strips. (You can see my very own nose pore strip here!) This uses salicylic and glycolic acid along with Eijitsu rose to loosen blackheads and tighten up pores. I won't hold my breath about this one, but with a name like vacuum cleaner I just have to try it. TréStiQue Mini Shadow Crayon - Aspen Pine (0.02oz sample value: $10??) I had to do a triple take to make sure I wrote that brand out correctly. This eye shadow crayon isn't for sale yet so Ipsters are truly getting first dibs. When I first pulled this out of the bag I thought they forgot to put a cap on it and had to tap the tip a few times before I realized that was the cover. Doh! The color I got is Aspen Pine which looks like a moss green according to the faux tip. This is a twist up crayon so no sharpener is necessary. Fun fact: the full size will have a smudger on the opposite end to create smokey eye looks! Smashbox Photo Finish Foundation Primer (0.25oz sample value: $9) - This is another thing I've wanted to try ever since I saw it in the bin alongside the checkout line at Sephora. That darn impulse bin. I always fall victim to it and end up picking something up because "it's only $5!" Argh. But you know what? I do like this. 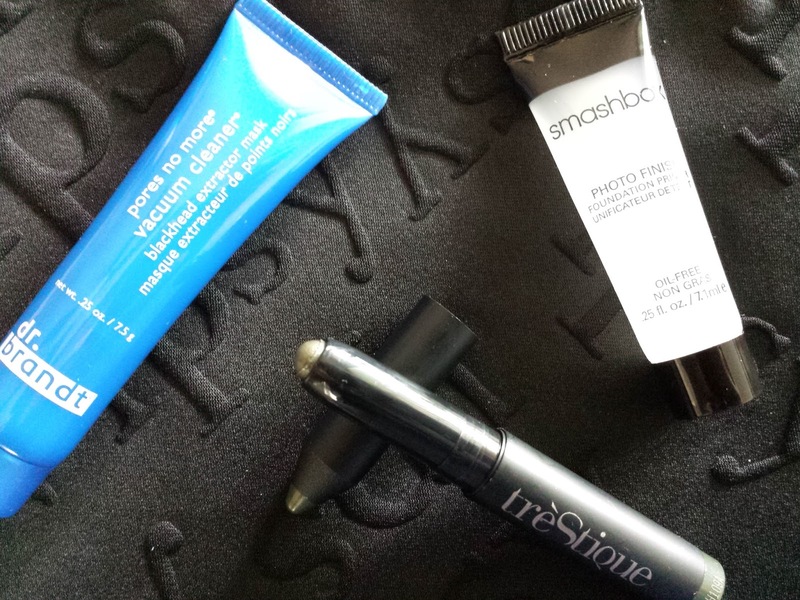 But I'm partial to silicone-based primers because I love that velvety smooth finish so I guess I'm biased. In addition to dimethicone, this primer also has sunflower, tea, and grape seed oils to moisturize skin. I will definitely be using this. Plus it takes me forever to go through primer so this tiny tube should last me several months. Makeup Bag - Holy meatballs Batman, this might be my favorite Ipsy makeup bag yet! It's neoprene with Ipsy embossed all over it. The words are actually a lot less apparent in person so it pretty much just looks like a plain black bag. I love plain and I love black. I guess I love boring? But even if it did have some other print I think I'd still love it because I love the material. It brings back memories of my kneepads I wore for sports but not in a gross way. I'm talking nostalgia here. 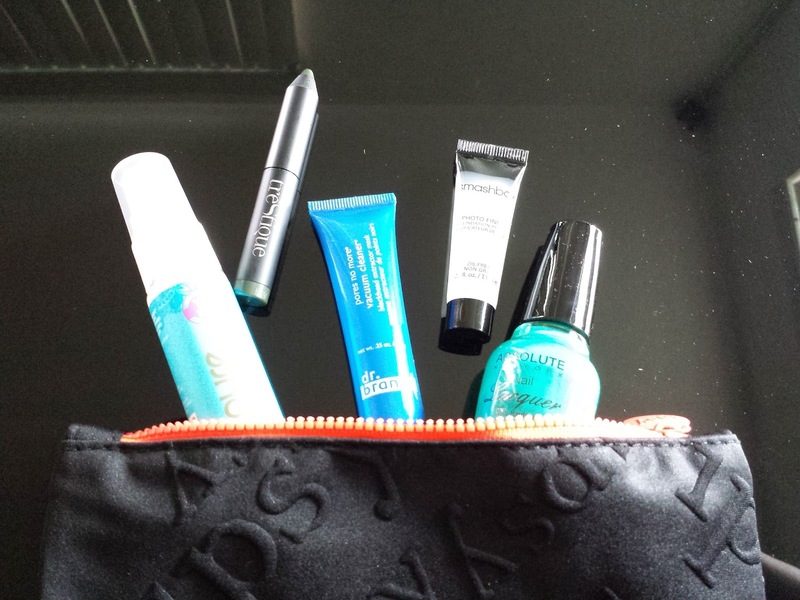 Thankfully, the inside of the bag is nylon so your eyeliners won't mark up the fabric. Okay. Deep breath. 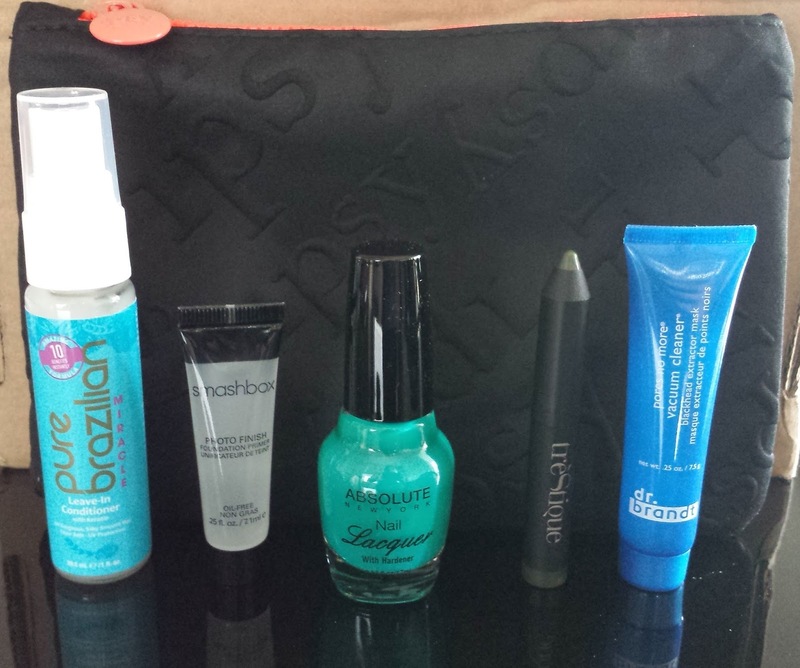 I think this is my favorite Ipsy Glam Bag to date! The items are valued at over $30 (not even including the eye crayon) and I'm actually going to be using over half the stuff PLUS I got a spiffy new makeup bag that I love. It's nice that I can actually see the connection to the Swim into Beauty theme. Blue things, neoprene bag - ocean, wetsuit - you get it. No waterproof makeup like I expected but that's okay. I don't swim with makeup anyway. Now playing in the rain with makeup on, that's another story. :) I'm such a little kid sometimes. To get your own Ipsy glam bag, click here to get on the wait list. You won't be charged for your first bag until you get off the list (it usually takes several weeks, but you can skip the wait by posting to Facebook and having a friend subscribe from your link).